The Elecro Vulcan Nano heaters are high quality pool heaters for above ground pools, a step up in quality from the traditional Intex pool heaters. The Elecro Vulcan Nano heaters are designed, developed and manufactured in the UK with robust and durable construction, and come with a 2 year warranty. The Elecro Nano heaters are high quality pool heaters for above ground pools, a step in quality from the traditional Intex pool heaters. The Elecro Nano heaters are manufactured in the UK with robust and durable construction, and come with a 2 year conditional warranty. 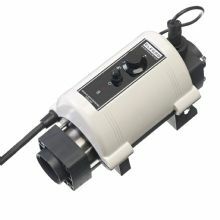 A 2.2kW Electric Heater by Intex for warming your above ground pool. 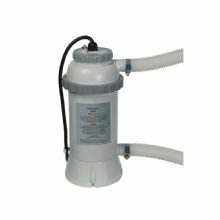 Simply connect inline with your existing pump and filter system, plug it in, and begin warming your pool water.